Owen Cobbe played for Irish in the 1990's, he is now a teacher and the Director of Rugby at Abingdon School. When/where did you start to play rugby? Normally 10 – but have played 9.12,13,15 and even wing – but very rarely!!! When did you join London Irish and how many games did you play? Joined 1991 – don’t know how many games I played in. 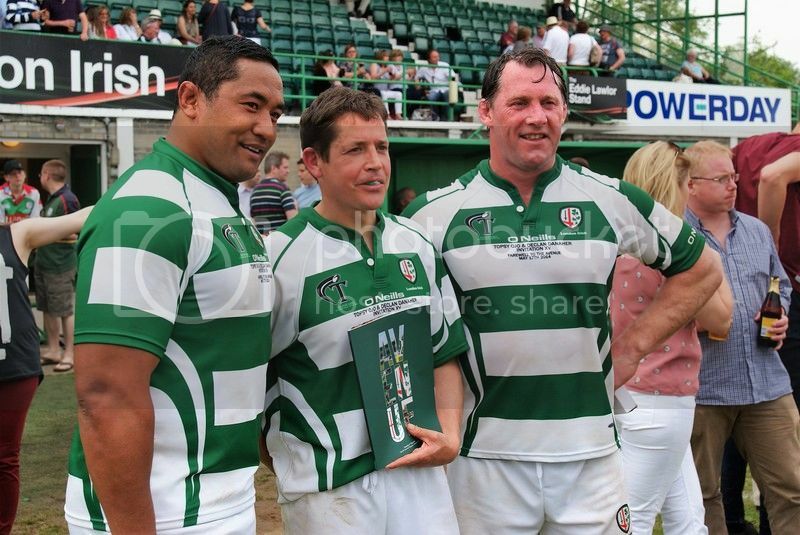 How many points did you score in your London Irish days? Again I don’t know, kicked a few conversions and penalties, can’t remember too many tries. What brought you to London Irish? Different coaches had different styles. I remember Hika’s Punch Policy to the losing team. Who were the coaches during your time at London Irish? Who were the captain(s) of London Irish in your time there? Who was your most difficult opponent? Where was your favorite away ground? What was Sunbury like in your time playing there? Who do you consider was the best player you played with for London Irish? Hendo could do great things, Korky was a reliable goal kicker, the pack all had different attributes. A young Rob doing great things! Who where the characters at Sunbury in your time playing? The above and Birdie, Burnsie, Halpin, Higgins, Geogeohan, Staples, Bish, Chuddy……..
You were with the club at the start of professionalism, how did this affect you? Things became more open, as students we were living on the grounds and getting some pocket money but when thins turned professional everything was more open. Do you still keep in contact with any of your old team mates? Yes, and still have some memorable sessions, more off the pitch then on. The professional London Irish team is no longer a team for Irish/Irish descent players, what are your feelings about this? You have to get results, I’m delighted to see Bob Casey at the club, I knew him in Ireland and he is a great character, you can’t get more Irish then Bob. Do you miss playing for London Irish? I had a great time there so I’d be lying if I said no. Do you have any favorite stories from your Irish days? Loads – mostly post match and involving drink. How good was the London Irish side you played in? (or) Which season had the strongest team? The squad was pretty much the same players during my time, we stayed up one year and went down the next and one promotion. Did you play for any other Irish/English clubs? Did you go on any over-sea's tours? Did you win any honours? Do you still watch rugby? When was the last time you attended a London Irish match? I have to say more then two season ago at the madjeski, which is pretty poor considering Toby Booth is my brother-in-law. Has your old position changed since you played? You have to be bigger and faster. Which modern day player would you have liked to play with? Do you prefer the rugby of today or when you played? Difficult to answer. I think there was a little more talent visable when I was playing, now most players are the same build and size and it makes things a little more even. Are you still involved in Rugby? I think I have with the above. But just in case any of the old squad read this, I have to say I was probably the slowest fly half at the club with the quickest hands.